2013 Dacia Sandero review | What Car? The Dacia Sandero isnt just bigger than your average supermini, it also costs thousands of pounds less to buy. At just over four metres long, it's substantially larger than a Ford Fiesta or Volkswagen Polo. Yet despite this size advantage, the Sandero costs from just 5995, making it Britains cheapest new car. 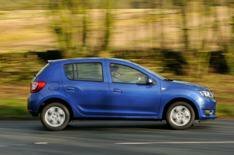 Whats the 2013 Dacia Sandero like to drive? The good news is that Dacia sources its engines from parent company Renault. This includes the 0.9-litre three-cylinder turbocharged petrol engine that also powers the latest Clio. The bad news is that this engine sounds a good deal less cultured in the Sandero than in the Renault; it emits a distinct rattle at tickover, and gets quite loud when worked hard, with a three-cylinder crackle as the revs rise. Despite the noise, however, its pretty smooth and delivers fairly brisk performance. That said, theres a fair bit of wind- and road noise generated at motorway speeds. The Sanderos suspension isnt the most sophisticated, either. The ride feels rather lumpy and the suspension sounds quite clattery around town, but then becomes increasingly wallowy as speed increases. Theres a fair bit of roll in corners, too, but because the steering gives you an encouraging amount of feedback, you always know which way the front wheels are pointing. Whats the 2013 Dacia Sandero like inside? As well as being big on value, the Sandero is exceptionally big on space. Theres loads of room in the front, and those in the rear will never feel like second-class citizens, thanks to the generous head-, leg- and elbowroom. Whats more, the Sandero actually feels even bigger than the tape measure suggests, because it has such large side windows. The boot is huge compared with other superminis, too, at 320 litres, and folding down the 60/40 split rear seatbacks frees up 1200 litres of space. However, they dont fold down entirely flat, and leave a pronounced slope when tipped forward. Given the price, its hardly surprising that the cabin finish is not particularly inspiring. The door panels and dashboard fascia are moulded from shiny, brittle plastics, the seat-height adjuster is crude and the floor carpets and boot lining also feel decidedly low rent. More evidence of cost cutting runs to the steering wheel, which can only be adjusted up and down (not in and out), and theres quite a bit of slack in most of the switchgear. That said, the controls are clearly laid out and easy to operate on the move. It was initially feared that the Sandero would only score a three-star crash-test rating. However, it managed a four-star Euro NCAP rating overall, which is much better but still behind most modern superminis. Equipment levels are scant if you stick with the entry-level Access model, because it doesnt even have a radio. Add 600 for a higher-spec Ambiance model, and youll get Bluetooth and a CD player. Increase your budget to 7995, and Laureate trim adds heated door mirrors, air-conditioning, front and rear electric windows, and cruise control. Even at this price the Sandero still looks like a bargain. It isnt the most refined supermini and its certainly not big on frills or safety, but it does offer an abundance of space and unrivalled affordability.